In the contemporary art, I guess painters have stopped doing outdoor production since long. "SEIKA" to be exhibited at this exhibition is a series in which myself expresses the objects (primarily vegetation) in front of the eyes on the canvas in the open air. 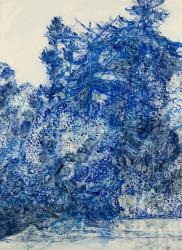 I began to express Oriental blue represented by blue paintings of china ceramics. I used natural pigment of ultramarine blue to represent luxurious and discreet blue. By further using black ink, I hope to reproduce / develop Ukiyo-e blue and ink harmony achieved by Katsushika Hokusai etc. in the present age. For me, the production in the open air is to explore and embody the existential form of human beings and paintings. It can be said that it is "phenomenology / existentialism" that has undergone post-modernism and post-structuralism. The artist will be present and talk. Admission free.